Here is a sad representation of the creativity in today’s Egypt. The country that once made great pyramids is now scratching out Anti-semitic toilet bowl cartoons. Egypt takes its turn with knocking the Danish cartoons today. The Islam “Dove of Peace” is shot with a Danish pen. Gee, it’s been been over half a year now, guys. Isn’t it about time you thought about something else? Sandmonkey takes a look at the pathetic cartoons published today in Egypt. 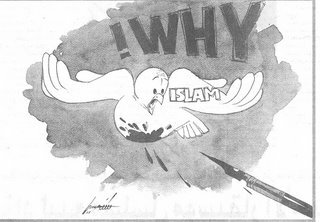 The cartoons were printed in a 2 page spread in Al Fagr newspaper, probably as a way to redeem the fact that they were the ones who first published the danish cartoons last October, when nobody gave a hoot before the Danish Imams stirred up the controversy.